PHLF is known across the nation for its pioneering work in restoring inner-city neighborhoods without dislocating the people who live there. 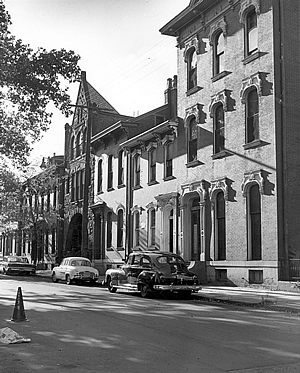 The very concept of our organization started on a city street in a historic neighborhood on Pittsburgh’s North Side. We have learned over the passage of time that, in terms of real preservation, the only thing that guarantees preservation is ownership: therefore we are expanding and emphasizing our easement program. And, we have learned that it is effective to use our funds, together with funds granted to us, to leverage preservation and restoration commitments by others. Advocacy, education, and all else come after those two efforts. For every project that PHLF takes on, there are probably 10 more worthwhile projects that must stay on the drawing boards. It is only through the generosity of our members and private foundations that we are able to bring many of our ideas to life. Our work today spans the breadth of this region and we know that PHLF has improved the quality of life for people and has succeeded in showing that historic preservation can be the key to achieving economic, social, and cultural renewal. Our work remains relevant and the need for our programs and services continues to grow as more historic religious properties, buildings, bridges, parks, main streets, and communities age—and as a new generation of people are born.